There is a story from an impeccable source that puts Chappo back-stage at the Sydney Opera House, a place he loved to frequent, and take guests who enjoyed his love of high-end culture. He never invited me. After a performance by the New Zealand Symphony Orchestra (conducted by Sir William Southgate, a long-time friend of Chappo’s), he was mixing with orchestra members and struck up a conversation in the wings of the stage with an Indian lady who played the grand piano. Chappo asked, “They actually have grand pianos in India?” It wasn’t one of his finest moments. The lady quickly took her leave, one of the few people not enchanted by the Chappo charm. On another occasion, when Helen and I hosted a simple finger-food dinner party for about 40 friends at our home in Menai, Chappo came into the kitchen expressing a fairly acute level of exasperation. Half the guests were in the family room off one side of the kitchen while the other half were in the lounge/dining area off the other side of the kitchen. It was a bog-standard project home design. Anglican Aid has just published a book called The Chappo Collection. I confess to being part author, part compiler, and part compactor. If the book is caned by the critics, then at least I have been a good compactor and compressed the story into as small a sound bite as possible. Although it is not a small book. The Chappo Collection seeks to honour the life of one who was a good friend to thousands. And yet, it is not hagiography. I have simply tried to give an honest account, through the many stories at my fingertips, of the life of the man whom many regard as the finest evangelist Australia has produced. There are people who were annoyed by the way he could consume all the verbal oxygen in a room. I had several who expressed their irritation to me. There were those who felt that their stories were not as valued as his and felt belittled by his dominance. Chappo could also be cutting one day, and apologetic the next. More than once I received the full force of his ferocious criticism over the phone of an evening, only to have him ring back the next morning full of remorse and repentance. He kept short accounts, quick to make amends. Chappo could also make a mean cup of coffee. But even that could mean his downfall. Back in the late 80’s and early 90’s when I would stay the night before a round of golf at his beloved Concord Golf Club, you would wake to the smell of freshly brewed coffee at Chappo’s. Remember, these were the days when Nescafe was the roast, and the boast, of the middle-classes, having snobbishly graduated from powder to granules, some from Pablo to Mocona - what it once meant to be aspirational. The politically incorrect things you could once get away with. He was master and commander of the politically incorrect. November has always been a special month for me. A hint of jasmine on the breeze. Jacarandas in full bloom. Historically; reminders of exam time, from both high school and Bible college days. But for the last five years, November has taken on another significance. The jasmine and jacaranda now always remind me of Chappo’s death, but more than that, his life and his legacy, and the aroma of the message of the Lord Jesus Christ. Five years ago this month, our friend Chappo was called home to be with his King and Saviour. He died on November 16th at St George Public Hospital, the same place where he was born 82 years earlier. His memorial/thanksgiving service was held just over a week later at St Andrew’s Cathedral, attended by almost a thousand friends. Not a bad crowd for an octogenarian. Many friends of 80-something-year-olds have usually pre-deceased them. 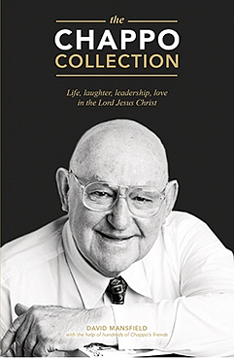 The Chappo Collection is a ‘warts and all’ account of the life of this remarkable servant of Jesus. Subtlety was never his strength. Have you ever wondered what the ‘all’ in ‘warts and all’ actually means? Wonder no more. At least, in Chappo’s case, it means ‘warts and wonder’ because, in Chappo’s case, while there were lots of warts, there were lots of wonderful things, that God by his grace, blessed us through the gifts he gave to our dear brother. The case against Chappo? Case dismissed. The case for Chappo? Well, you’d better buy the book and decide for yourself.